AMP clean room doors are absolutely leakproof for pharmaceutical companies, hospitals, with polyurethane insulation, single and double leaf, with lock and stainless handle with U shape. Contemporary design and aesthetics, soundproofing and thermal insulation doors AMP Clean Room doors for sanitary applications carry a special coating film with antibacterial properties. An antibacterial action is activated on environmental conditions that usually favor the proliferation of bacteria, fungi and algae. This antimicrobial coating has a dual effect, prevents the growth of microbes and fights those that may have been created. The steel sheets with polyester coating with antibacterial properties, offer long-term protection and hygiene, even in places where cleaning is not guaranteed. The coating of clean room doors offers proven effectiveness against different types of bacteria such as staphylococcus, salmonella, escherichia coli, listeria etc.. 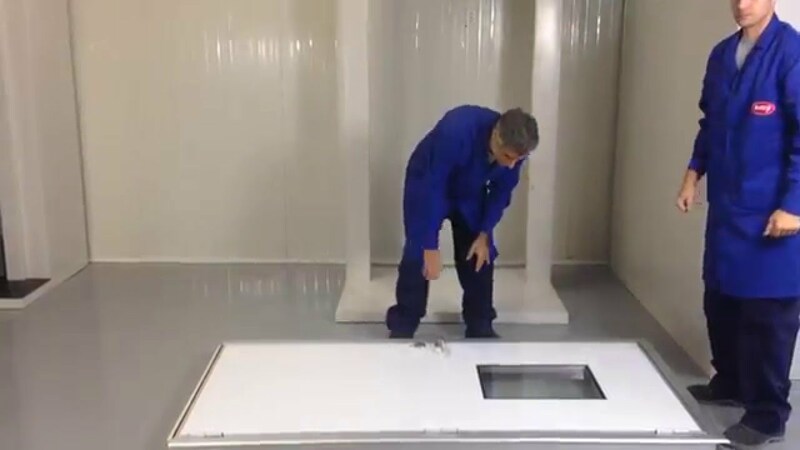 In order to meet the specifications for clean room doors, in areas for the manufacturing of drugs, surgeries, hospitals, the gap between the door and the floor should be sealed, preventing the transportation of air, smoke, dust and sound.